A typical concept of forms of Karate which originated in southern China, it is pronounced “mochimi” in standard Japanese, and “muchimi” in Okinawan pronunciation. 1) 餅身. Here mochi 餅 specifically refers to the Japanese rice cake called Mochi. In this way, this composite word provides an analogy to “rice-cake body”. As regards the dangers of rice-cakes, read this. 2) 糯身. Here mochi 糯 specifically refers to glutinous rice. This is because there is also non-sticky rice, which is called Tō-gumī 唐米 in Okinawan dialect. It means Chinese rice or foreign rice, one that had been imported from Southern China, Indochina and such. It is not a glutinous and therefore cannot be pinched with the chopsticks, but falls down. 3) 黐身. Here mochi 黐 refers to sticky, and particularly to bird-lime, used to catch small birds and insects. It is also used for wood glue. This character is also found in the Cantonese terms Chi-sao 黐手 (sticky hands) and Chi-gerk 黐脚 (sticky legs) as found in Wing Tsun. In practice, muchimi refers to tactual manoeuvres while adhering to the opponent’s movements in direct contact. It uses the defensive reflexes hardwired in the human body, aligns them to logical concepts of geometry, directions, vectors and such, and adds logical counter measures (attacks) under consideration of anatomy, laws, terrain etc. to become a complex yet automated chain of action. Reaction from tactual manoeuvres are faster than reactions from information processed through the eyes and ears. That is why muchimi has to be treated as a single category of standing close-quarter combat. It is closer than the standing close range where the opponents are not directly engaged by contact of their extremeties and in which the eyes have superior importance. For example, you don’t want to be inside the hitting-zone all the time, but want to tactically prepare the opponent by various techniques and particularly by combinations to enter the opponent’s striking zone. At the same time muchimi is farther than standing grappling, which might include the seizing of the whole body, preparation for throws and the like, where you move the whole body of the opponent, and while also possibly manipulating the opponent‘s limbs towards and over the terminal degree of freedom of the joints, this is not the sole target in this distance. For example, it is one of two good choices to move in closer and wrestle if someone tries to attack your joints. In this way, the standing close range can be divided into three sub-divisions. The following photo is unrelated to Mochi rice-cake. 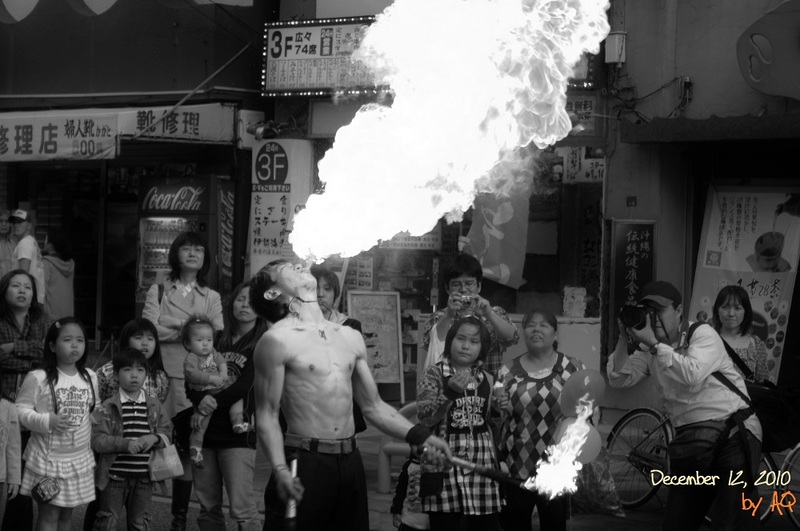 Fire-breather and onlookers, Naha, December 12, 2010. Photo: A. Quast. This entry was posted in Misc and tagged mochimi, muchimi. Bookmark the permalink.